RUMOR MILL: NHRA LOOKING TO SLOW NITRO CARS AGAIN? From what we hear the NHRA's tech department is looking to use the supercharger configuration as a means of slowing the fuel cars down even more in 2019. And, from what we hear in the pits, the idea is going to fly with the fuel teams as well as a lead balloon. Read more about RUMOR MILL: NHRA LOOKING TO SLOW NITRO CARS AGAIN? RUMOR MILL - WILL JIM O BE IN DALLAS TUNING? We have heard from multiple sources that new free agent tuner Jim Oberhofer will be at the NHRA FallNationals in Dallas tuning a Top Fuel dragster. Our team is still chasing down official comment, and once we can confirm we publish an official story. Read more about RUMOR MILL - WILL JIM O BE IN DALLAS TUNING? RUMOR MILL - THE CREW CHIEF CAROUSEL SOON TO START TURNING? Just like Hurricane season is churning in the Atlantic ocean, rumors are suggesting the crew chief carousel may soon starting turning in the rough and tumble world of NHRA nitro racing. We are still investigating, but the word on the rumor mill suggests at least one major team has made a change at crew chief we will let you know as soon as we can get official confirmation. Read more about RUMOR MILL - THE CREW CHIEF CAROUSEL SOON TO START TURNING? RUMOR MILL - A MONGOOSE TRIBUTE CAR COMING? It will be a truly fitting gesture. We are told at keast one Top Fuel team will be outfitting their Top Fuel dragster during the Chevrolet Performance U.S. Nationals in a vintage Tom McEwen tribute during the Labor Day weekend. Word has it the 1978 Funny Car scheme, on the 40th anniversary of his most epic victory ever. Read more about RUMOR MILL - A MONGOOSE TRIBUTE CAR COMING? 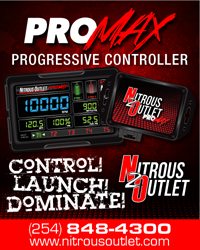 RUMOR MILL - NHRA PRO STOCK CHANGING AGAIN? Read more about RUMOR MILL - NHRA PRO STOCK CHANGING AGAIN? Read more about RUMOR MILL - WJ GUNNING FOR 300 MPH? RUMOR MILL - NEW FUNNY CAR BODY COMING SOON? Looks like there's a new Funny Car body headed to the NHRA Mello Yello Drag Racing Series. Word has it the 2019 Dodge Charger body will make its maiden runs on Monday following the Summit Racing Equipment NHRA Nationals in Norwalk. Ohio. If all goes well we understand the new body could make its competition debut at the Mopar NHRA Mile High Nationals in July. Read more about RUMOR MILL - NEW FUNNY CAR BODY COMING SOON? Read more about RUMOR MILL - JORDAN VANDERGRIFF LOOKING FOR THE NEXT LEVEL? Read more about RUMOR MILL - MORE CO-CREW CHIEF TURNOVER?